Enhancing our yoga practice with chairs was the theme of our extended practice on Sunday and it’s amazing what a good teacher the chair is! Using the chairs we worked to improve and maintain the correct alignment in various standing poses – the chairs also helped us to explore the asanas in more depth. 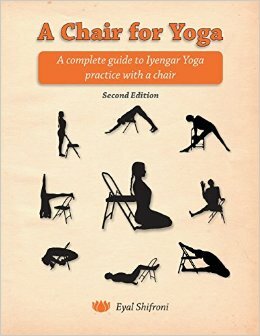 Eyal Shifroni’s book A Chair for Yoga has a wealth of information in how to use this prop. Do take a look! Sunday’s class was a revelation. The chair work was amazing. Thank you.